IME BECAS Scholarships Funds Awarded: The funding is part of the Institute for Mexicans Abroad (IME) “BECAS for a Better Life,” a fundraising program that was created by the Mexican government in 2005 to support the development and well being of Mexican migrant students living in the United States. The program’s ultimate goal is to help develop a more educated and better-trained work force by supporting underserved students to continue or begin their academic development. 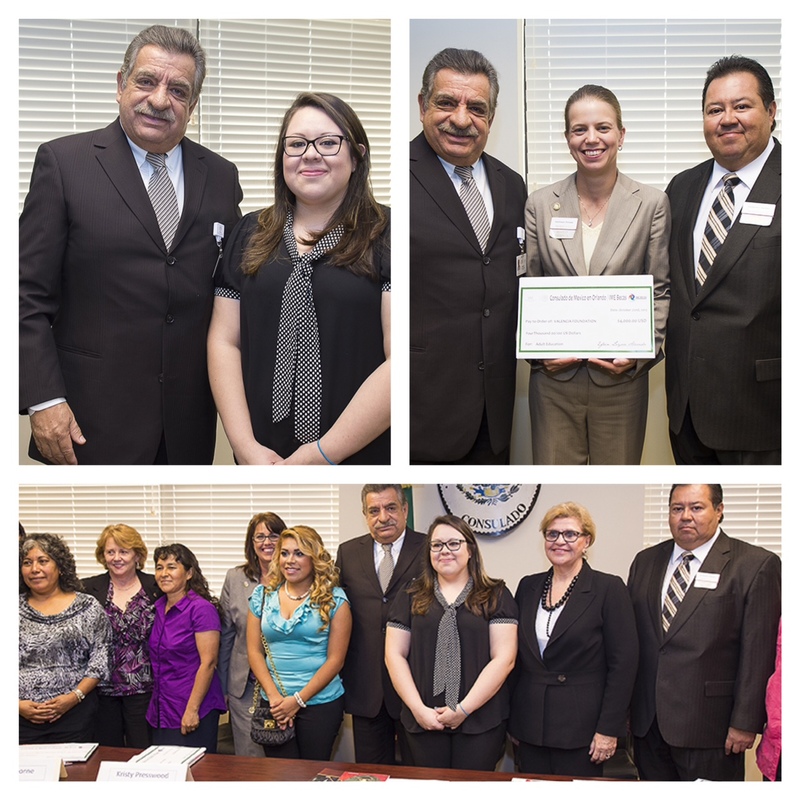 The Mexican Consulate in Orlando awarded Valencia College $4,000 in scholarships to benefit Mexican-American students. Together with matching dollars from the Valencia Foundation, the college will award four students each with a $2,000 scholarship. Recipients must be current Valencia students who are Mexican or of Mexican descent. A total of $28,000 was awarded by the consulate to three Florida colleges and two nonprofits during a ceremony held earlier today at the consulate. Each award will be matched by the recipients’ foundations to provide $56,000 in scholarships to benefit more than 160 students. Hispanics make up the largest minority group at Valencia at 31 percent. In the last five years, Hispanic enrollment at the college has grown by 37%, or 4,959 students. Carolina Lopez, married with small children, will be the first in her family to graduate from college. She’s studying for her A.S. in nursing—a highly competitive and rigorous program—and plans to complete her bachelor’s in nursing at UCF. The funding is part of the Institute for Mexicans Abroad (IME) “BECAS for a Better Life,” a fundraising program that was created by the Mexican government in 2005 to support the development and well being of Mexican migrant students living in the United States. The program’s ultimate goal is to help develop a more educated and better-trained work force by supporting underserved students to continue or begin their academic development.